Ruby (from lat. rubens, rubinus — red)Ruby is one of the most expensive jewels. It occupies the second place on hardness after diamond. The jewel gets its color due to the chrome impurity.The preference is given to the Asian rubys. They are exported from Myanka, Thailand and Sri Lanka. Rubies from East Africa, from such countries, as Kenya and Tanzania are in demand as well. the 1st quality — pure rubies with insignificant defects in the form of rare strips, points, inclusions in various zones of the jewel. 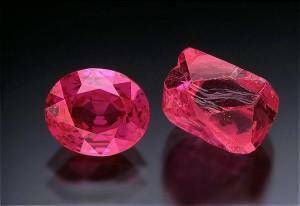 the 2nd quality — rubies with small defects in the form of cracks, strips in combined with dot inclusions of other minerals, nets in different zones of the jewel. the 3rd quality — rubies with defects in the form of cracks, strips, dot inclusions of other minerals widespread on all the jewel, with turbid zones. Such jewel loses its shine and doesn’t sparkle. Ruby is the jewel of love and passion. It is the symbol of power and force. Ruby is considered to confer its owner the force of a lion, fearlessness of an eagle and the wisdom of a snake.